MIB is my interpretation of Polo Black. It has notes of sandalwood, tonka bean, patchouli, mango, sage, tangerine, lemon and wormwood. Available as a ‪#‎shavingsoap‬ or ‪#‎aftershave‬ . Choose tallow or the vegan version. 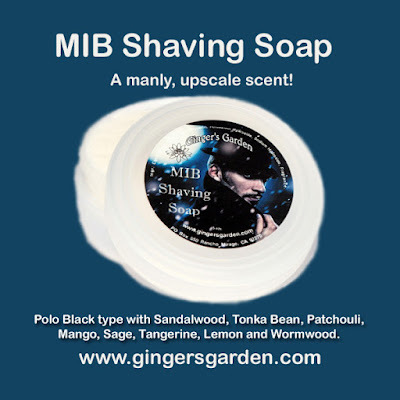 Tallow shaving soap contains: Stearic Acid, Tallow, Olive, Coconut, Palm Kernel, Mango Butter, Sodium Hydroxide, Potassium Hydroxide, Castor, Beeswax, fragrance. Vegan shaving soap contains: Coconut oil (Cocos Nucifera), Stearic Acid, Potassium Hydroxide, Sodium Hydroxide, Kosher vegetable glycerin, Fragrance. Either version will give you a smooth close shave. I prefer to use a shaving brush and a bowl, but you can face lather too. The vegan shaving soap is a thirsty soap, so you might need a bit more water. MIB shaving soap comes in a reusable jar that can be either opened from the top, or take the lid off and build lather right in the jar. It is available at Ginger's Garden.